Sharpening Serrated Blades 101 – What You Need To Know! Home Knife Sharpening Sharpening Serrated Blades 101 – What You Need To Know! It’s so true! We all own and use serrated blades. Some use them to cut a slice of baguette, and some to chop through that sizzling prime rib steak. Others have serrations on their pocket and hunting knives. The point is that everyone has one! Logically then, it only makes sense that we know the process of how to sharpen a serrated knife, so they stay well maintained and last a lifetime. This is especially true for anyone who owns an expensive set of serrated blades. And heck even if you don’t own an expensive set but instead a cheap $10 one, at least you’ll now have some information on how to sharpen a serrated knife should you ever require to do so. There’s no point chucking your old ones out and spending unnecessary cash for new ones. Have you ever pulled that one steak right off the barbecue, thrown it on your plate, grabbed your steak knife, and wrestled the steak to death having hardly had any? That’s been me on so many different occasions! 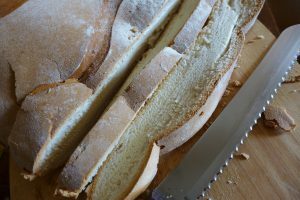 This post is specifically for those people and for anyone who squashes the baguette instead of cutting through! So what exactly is a serrated blade, and how does it differ from a typical plain edge style? I like the definition given by knifeart, so I’ll use it here. Serrated edges are blades that have some kind of toothed or saw-like edge ground into on the cutting surface. Generally speaking, the presence of these “teeth/dents” result in minimal contact area with the material being cut, and therefore a greater pressure in comparison to a standard plain edge. If you were to get all scientific about this, you could apply the formula of Pressure=Force/Area to better understand what is happening. When comparing serrated vs. non serrated, we can assume the force applied using both will be the same (constant). The only variable is area then, and the serrated edge has less contact area (because of the teeth/dents) in comparison to the plain edge. Hence, the pressure will be higher for a serrated blade and it will therefore cut materials faster, but not necessarily cleaner. Try to visualize how this comparison would work with a hard bread (I mention baguette previously). 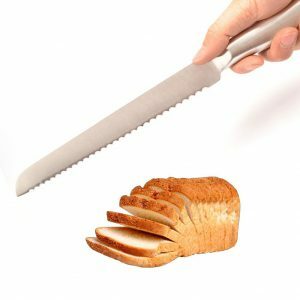 A plain edge would simply compress and squash the bread whereas a serrated one would tear the crust so the edge can start cutting. You may be thinking at this point, a serrated edge is better than a plain edge, but this is simply not true. Each edge style has its own specific uses, as well as its limitations. To determine what’s best for you, you’ll need to better understand what you will be using it for. This is a separate discussion altogether (I may have a blog post about this in the future). Should You Use An Electric Knife Sharpener To Sharpen A Serrated Blade? This tends to be a question with differing opinions. When talking about how to sharpen a serrated knife, I tend to remain extra cautious when considering electric sharpeners. Now, some companies claim that their product will work on serrations, and I am not here to argue that. There are people who claim to have had positive results when working on serrations with an electric style, and I don’t necessarily disagree. What I do think, however, is that there is a better way to work on serrated edges and using an electric style does not help accomplish this. The thing with electric styles is that you can’t control the process. What do I mean by this? What I mean is you ultimately can’t alter how much material is removed from the edge. You place your edge in one of the stages and let it do its thing. Why does control matter or the amount of material taken off? Well that’s a great question! It matters because you end up losing serration each time you sharpen this way. Keep doing it this way and the extreme case is you may end up with a plain edge, losing all serration. Important Advice That Could Save Your Edge! Before we get into how to sharpen a serrated knife, I would like to provide some valuable advice that I wish you would seriously consider. Sharpening serrated edges requires patience, as the process involves paying special attention to each individual serration. There’s also a technique involved and while it may be easier for some, it could take time for others to master. The main idea here is to be in control so you don’t end up with a plain edge from a serrated one! If you have an expensive set of serrated blades and are not sure if you’d be comfortable sharpening each serration, I’d suggest you consider giving your knives to a professional sharpening service company. There is nothing worse than an expensive investment going down the drain because you wanted to save a couple of dollars to do it yourself. The pros exist for a reason! USE THEM! How To Sharpen A Serrated Knife: The Proven, Right Way That Works! 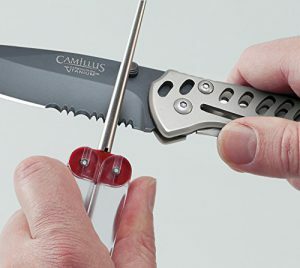 Alright, so you’ve decided to work on your serrated edge….what next? You will need to look into purchasing a sharpener that is capable of working on serrated blades. I recommend using the DMT Diafold Serrated Knife Sharpener (click the link to check it out on amazon). 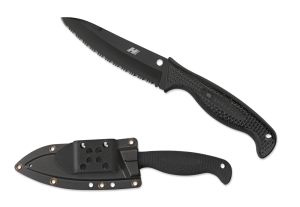 This device is specifically designed to work on serrations, and comes in three different diamond grit variations: coarse, fine, and extra fine. Gauge what condition your edge is in and pick your grit accordingly. If your blade is extremely dull, you may want to consider the coarse grit. If your blade is only somewhat dull, pick the fine grit. Pick the extra fine if your blade only needs a touch up or polish. The cool thing about this product is it’s portable, lightweight and easy to store! So how do you work this thing? It’s not that hard actually. First I would suggest you get a feel of how big the gap/spacing is between each tooth/serration. Do this by sliding the rod into the serration and stop at the point where you have a tight all contact fit between rod and serration. You will note that the rod is designed to work on serrations of various sizes (small serrations in the beginning of the rod, and larger serrations towards the end of the rod, near the handle). Now you can sharpen! To do this, hold the knife such that the serrations are parallel to the table surface, and hold the rod such that it too is parallel to the table surface. Firmly run the rod into the serrations by using short, quick strokes. Remember to always pull the rod away from each serration! Focus on keeping your technique consistent. Do this until you have completed all serrations. Again, remember technique is key! Don’t rush to do things in a haphazard manner. Take your time to do it properly. If you don’t feel comfortable working on your serrated edge, seek professional help. It may also be worthwhile for you to try working on a cheaper blade so you can get the hang of it. See if you can nail down the technique and go from there. I found a cool video that does a much better job at describing the technique than I do. It’s in your best interest to check it out (credit to Thomas Stuckey and Expertvillage). I hope this post has helped to answer the question: How To Sharpen A Serrated Knife. If you have done things differently that worked for you, I’d love to hear! Please drop me a comment below! Cheers and thanks again for visiting myelectricknifesharpener! I sharpen my own straight edged knives, but never thought about my serrated ones. Will probably let the pros do it. Thanks for such a detailed post. Sure was eye-opening to me! Thanks for the read Faithe! For a number of years I have sharpened my straight edge knives myself but a bit hesitant to try my serrated knives. This might be just the ticket! If it’s an expensive set, go with the professionals. If you can afford to try it out on an inexpensive serrated knife, absolutely go for it! Remember, technique is number 1! I started out after high school in the meat packing industry, and from there my Dad who was a butcher and meat cutter his whole life as his Father before him. Well my Dad and I went into business in our own Custom Butcher shop, so I’ve sharpened more than my share of butchering and meat cutting knives, but I’ve never tried a serrated edge. I do own a cheaper set of serrated knives that need sharpening,and the tool you show looks like it will do the task nicely. Thanks for the informative post! Thanks for stopping by. Absolutely, go for it! Remember technique is most important! Cheers! great post, I also never realised that you could sharpen serrated knives so this is a great place to start as it caught my attention. I have a couple of knife sharpeners but I’m not sure if these will work. 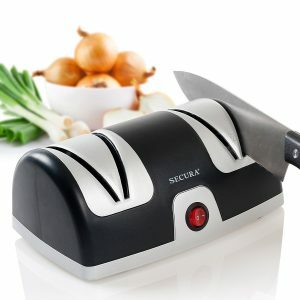 Is there any simple method to work out whether I can use a ‘normal’ knife sharpener’ or not? Sharpening serrated knives are a different ball game altogether. I would avoid using electric knife sharpeners because you can’t control the amount of material taken off. Using a sharpening rod or a manual sharpener like the DMT allows you to maintain this control. Hope this helps! I’m a big knife fan but could never really sharpen my knives the way I wanted to. Well in other words get them as sharp as I want them. I would always end up just buying another knife. It is good to have a website that teaches you the ins and outs of knife sharpening. I just bought a new knife and pretty soon I am going to need to sharpen it. I will most definitely be back to your website. Good work. Thanks for the read! Please be sure to check back soon as we will be having more interesting content and how to articles! I’ve spent a lifetime throwing out dull cheap serrated knives because I just could not figure out how I was supposed to do it. I’ve never gotten any fancy expensive serrated knives as a result. A hand-tool that’s cheap and takes just a little bit of hand-action is a heck of a bargain! Thanks for sharing! I am glad you got some value out of it. If you have any questions, please do let me know! Cheers! This was such a useful post for me! I got a really nice set of knives the christmas before last and I have finally got round to researching how I should sharpen them and what the best tool to use is. Great video too. Thanks so much for the great advice! Thanks for reading! I am glad you got some value from my post. Please let me know if you have any questions. Cheers!